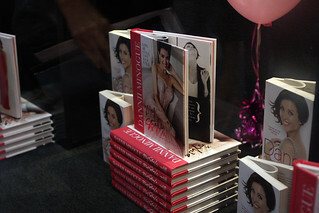 Earlier this evening famous Australian singer and model plus Dannii Mingoue launched her new book, Dannii: My Style. Dannii drew a crowd of hundreds to Dymocks' George St for a book-signing and photograph session. Minogue, all over Aussie TV at the moment in her role as Australia's Got Talent judge braved the wet weather to do the store appearance, whilst juggling a number of professional responsibility's, not to mention being a busy mum. Dannii has enjoyed a wonderful career - television, acting, modelling and more, and the book shares lots of that with the reader. The book shares her fashion sense and style "secrets", illustrated with a number of fan photos of Dannii. She certainly look a picture of health, much of which is due to great dieting...watching what she eats of course. Just a few weeks ago Danni had her wax figure done for Sydney's new Madame Tussauds museum at Darling Harbour. Will sister Kylie also get hers done - we suspect so. Well done to everyone associated with the success of the launch.